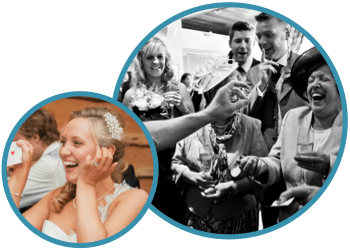 Your wedding day is the most momentous of your whole life – an amazing celebration that brings together families and friends, past and present, near and far. It means so much to everyone that there’s huge expectation riding on a single day – you’ve got to get it right, first time! And, let’s be honest, a wedding is probably the most joyous, but challenging, event you can ever organise! Emotions are running high, there’s so much to think about, and you really want to make your special day a little different. If that’s not a tall enough order, there’s the guests – a huge mix of ages and backgrounds, each with their own opinions, foibles and stories. It definitely calls for a magicians touch! David’s warm character and his amazing array of close-up magic tricks will prove invaluable throughout the day. He is quick to relax people, get them mingling and chatting, then ensures everyone is kept amused and entertained as your day moves through its many stages. 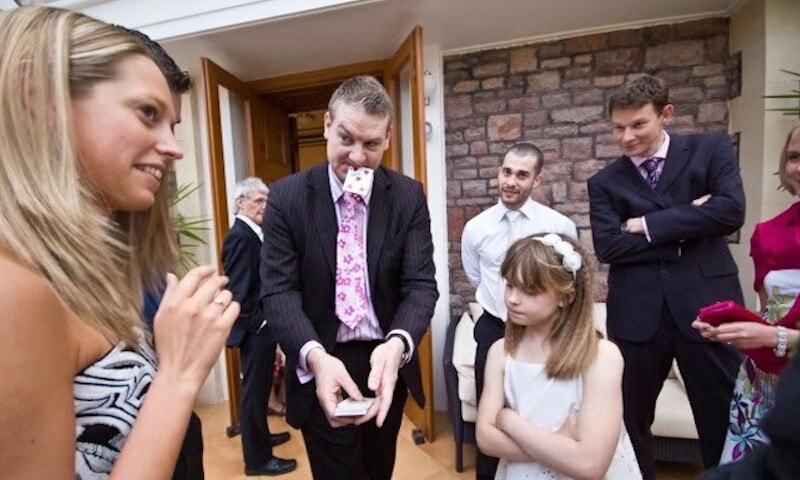 When’s the best time for a magician at your wedding? Can you Imagine a Better Ice Breaker? The Perfect choice to entertain your wedding guests. Immediately after the ceremony is a crucial time – the bride and groom are occupied with the photographer, so there can be a lull for those not directly involved. It’s also the first chance guests have to socialise properly. 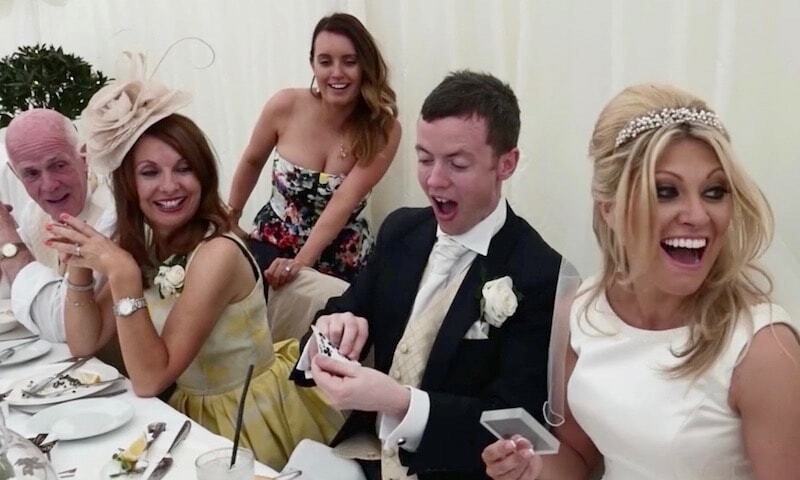 This is a great time for a wedding magician to mingle with guests, get different groups to come together, and generally break the ice. David will perform short bursts of close-up magic, paying particular attention to those who may be struggling to get into the swing of things. These little entertainment slots provide ideal talking points where strangers can start to become lifelong friends. As an experienced strolling wedding entertainer David is a master at setting the tone for a wonderful day full of fond memories. The formality of this part of the proceedings means that complete strangers may be seated together. Working discretely between the courses David will perform short sequences of interactive close-up magic that gets everyone involved and over any self consciousness. Awkward silences are soon over as he draws people out of themselves and as soon as one table starts to have fun the others follow – the whole atmosphere becomes more lively and relaxed. David also works closely with the waiting staff to ensure that those waiting longest for their food don’t have time to notice! 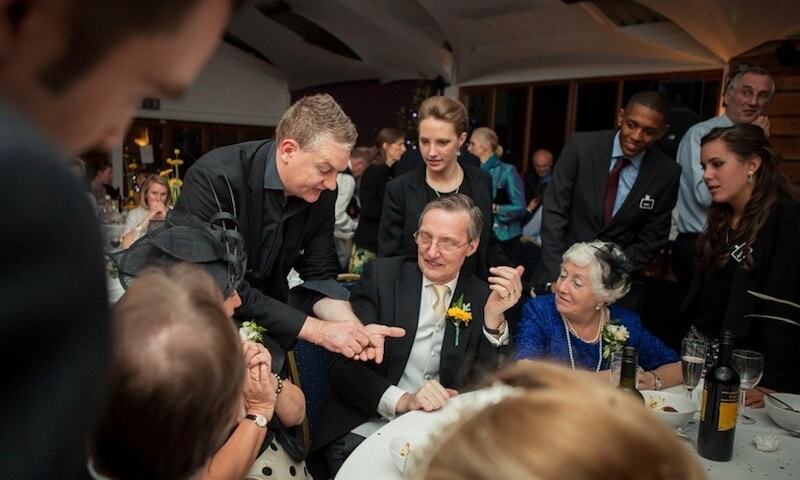 By now your guests are probably quite capable of making their own conversation and entertainment but David will add that little extra with good fun close-up magic in an informal mix-and-mingle style to ensure the day finishes on a fun note. By getting your guests to relax and talk, gasp and laugh, David will ensure a wonderful store of memories for everyone. Your occasion will be truly magic, and that’s the greatest trick of all.